Should you be wandering around the streets of Copenhagen, Denmark, in the month of May 1999, in the old part of town they call indre byen (inner city), you would certainly go by Rundtårnet (the Round Tower), and turning a corner would find yourself on Krystalgade. And going down that street a ways you would pass Kobenhavns Hovedbibliotek (Copenhagen Head Library), and in their windowns you would see large-format pages of original comic book art by various Danish artists, part of an exhibition displayed inside. 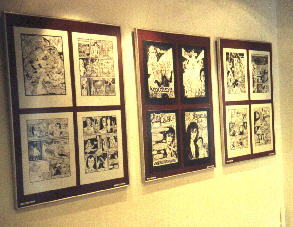 And hey, look, you might also notice that several windows were filled with original art from ARMAGEDDONQUEST. Suddenly interested, you would peer inside through the glass to see that there was an entire AQ Room in there: drawings on the walls (and floor), and a sofa with a complete set of the AQ Trilogy to read in comfort. 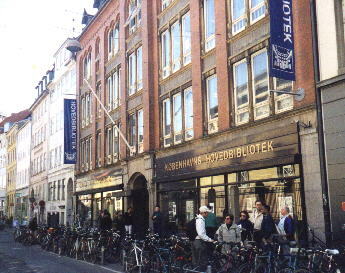 This is Det Kulørte Bibliotek (the Colored Library), the Comic Book department of Kobenhavns Hovedbibliotek. That's right, the Danish headquarters of public literacy and culture pushes comic books, and has a specialized library department just for that purpose. Actually, there is a wealth of good stuff to push: the European comics scene--especially the French--is very vital and grandoise; American comics have had a power renaissance that hasn't topped out yet; Japanese manga is emerging as an unique pop-art form; etc. So the Danes treat comic books seriously, considering them to be just as literate and respectable an art form as "real" books, or music, or movies, and therefore have them available in libraries. Det Kulørte Bibliotek bought four sets of my own AQ Trilogy last year, upon the apparently enthusiastic reccomendations of some young library assistants who had read AQ. The department librarian, Inge Kandil, informs me however that the books are hard to get a hold of because they are always checked out. Inge is herself also enthusiastic about AQ, and because I live in Copenhagen wanted to include AQ and me in an exhibition of "local author/artists", with an emphasis upon the coming "New Millenium". Being a cultural center, the library regularly holds udstillinger (exhibitions) featuring news-or-noteworthy graphic literature, presentations of original drawings by guest artists, essays and analysis of works and creators, stuff like that. I was, of course, flattered, honored, etc, to be invited to represent ARMAGEDDONQUEST in such an exhibition, and gladly assembled the material. Most of the artwork I contributed is displayed here in the AQ Gallery of this Home Page, but also an entire 12-page Tazio story (published in Sirius' Crypt of Dawn #2 as a teaser to the AQ Trilogy). 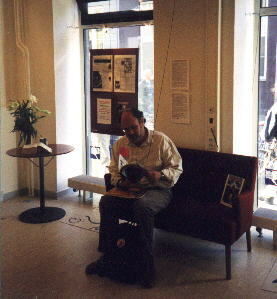 The Exhibition will be on display throughout the month of May 1999.